Legend has it that some groups of Native American Indians considered fresh pecan milk to be one of nature's best foods for promoting high energy. They made it by using a mortar and pestle to pound raw pecans into a buttery paste, then adding water and stirring until they had deeply nourishing pecan milk, which was easily digested by their infants and elders. You can make your own fresh pecan milk by combining a few tablespoons of Artisana's buttery pecan purée with water and giving it a quick blend. For added sweetness, you can throw in a few dates or a natural sweetener like raw honey. Artisana's organic raw pecan is also excellent on its own by the spoonful, or processed together with soaked dates and a touch of cocoa powder to make the healthiest and most decadent truffles you can imagine. This special pecan butter is handcrafted from fresh (not roasted) nuts using a low temperature process (below 115° F) that ensures preservation of heat-sensitive nutrients. It's made from 100% certified organic pecans and cashews in a facility that does not process any peanut, gluten, or dairy products. Pecans contain a number of phytochemicals that offer antioxidant protection against chronic health challenges like heart disease, diabetes, and cancer. Pecans contain 19 different vitamins and minerals, including vitamin B1, B2, B3, B6, folate, calcium, magnesium, iron, zinc, and potassium. Pecans are naturally abundant in monounsaturated fatty acids, which numerous studies indicate are helpful in reducing risk of cardiovascular disease. Finally, pecans are rich in healthy protein, making it an excellent food choice for people who follow a plant-based diet. Pecans are sodium-free and an excellent food choice for low-carbohydrate diets. Why are there cashews in Artisana Pecan Butter? Cashews make the pecan butter more creamy and spreadable. Cashews also act as a natural sweetener to temper the natural mild bitterness of the pecan skins, which are included for their health benefits. Does Artisana Pecan Butter need to be refrigerated? 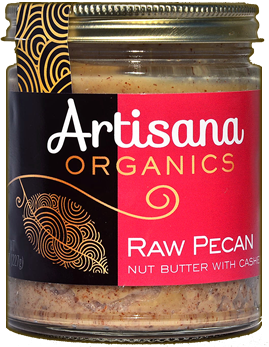 Artisana Pecan Butter does not need to be refrigerated for more than 18 months after they are produced. If you plan on using Artisana Pecan Butter within a month of receiving it, refrigeration is not necessary, provided that you use only clean and dry utensils in the bottle. It's easier to use the butter when it's at room temperature. 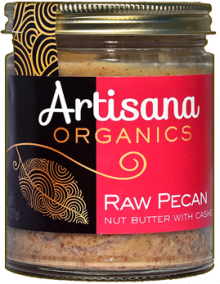 What are some different ways to use Artisana Pecan Butter? Please note that this delicious pecan butter comes in an 8-ounce glass jar.